I transplanted my tomato plant about three weeks ago, in a pot with potting soil. There is plenty of room in the pot as well. It is outside all day and the weather here is about 75 degrees at night and 85-90 during the day. I water the tomato plant every three days, longer if there is rain. Around last week, it rained pretty hard for a couple of days. The tomato plant is blossoming (about ten flowers now) and was doing great until the past three days. I’ve noticed that several stems and leaves on the lower part of the plant seem to be drying and withering. In the past day or two, some stems have also been falling off. What is the reason behind this? You have drainage holes in the pot - it may be that the pot is slightly too large for the plant, but as its been in there for 3 weeks, its a bit late to try to rectify that if that is an issue. Usual size of pot for a tomato plant is 9 inches. There is something that looks like dots of some sort on the stem at the bottom of the picture - I can't tell what it is because magnifying the image doesn't make the dots any clearer, but just make sure they're not aphids. Otherwise, watering - there are holes in your pot, and so long as they're not obstructed by something, excess water is able to drain away freely from the bottom of the pot. Water when the surface of the soil feels just about dry to the touch, and water thoroughly, with around 2 litres of water. You should be seeing water seeping out at the bottom - if that happens immediately, it means the soil in the pot is so dry the water's just running straight through and not being absorbed, so you'd need to water and then go back and do it again and possibly again until its damp all the way through and able to absorb enough water. Let the excess drain away, and don't water again until the soil feels just about dry once more. If your plant is in full sun in those temperatures, it may require this much water every day, possibly morning and evening. If you've only been watering a little bit each time, it's possible the soil around the rootball is relatively dry, so a good soak and less often is better. And a word about rain - unless the rain is absolutely torrential for hours, and your plant is very small, not much of that rain gets into the pot, so you still need to water. This is a fungus attack due to high humidity in the air. Try to prune your plants by removing the suckers and remove lower leaves for better air circulation. And administer a treatment based on a systemic fungicid (some based on neonicotinoids). You also can reduce the waterind to once a week. Remeber: excess water is worse than drought. Not the answer you're looking for? Browse other questions tagged diagnosis plant-health leaves tomatoes or ask your own question. What does it mean if my tomato leaves are curling? 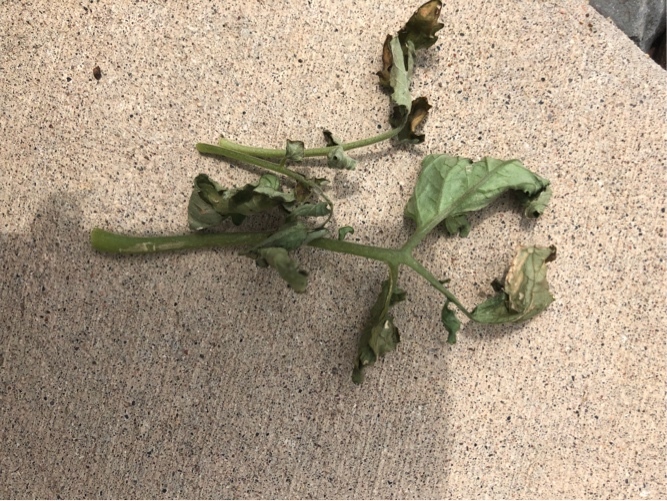 What is causing dark spots on my tomato leaves? 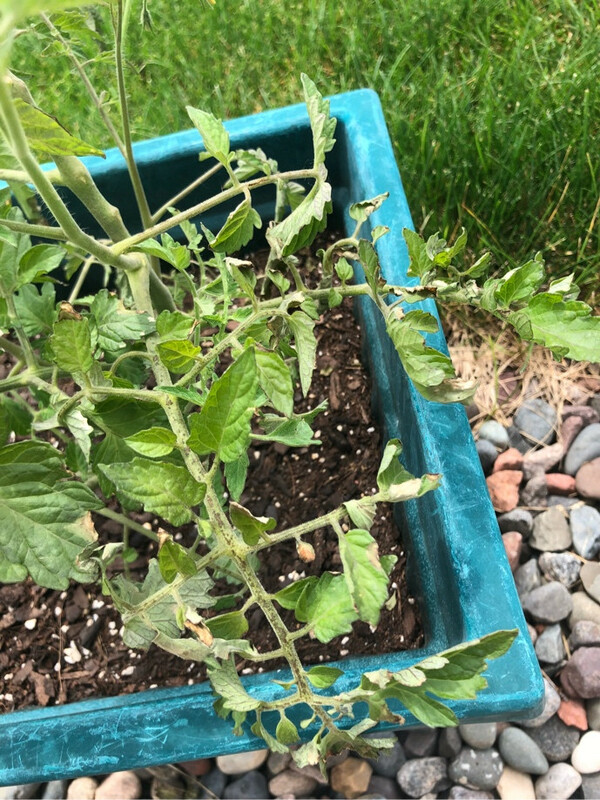 What is wrong with my beefsteak tomato? Do purple leafs of tomato return to normal state? Why are the blossoms falling off my tomato plant?